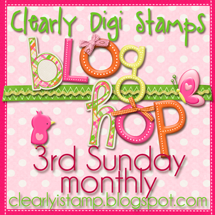 These blog hops are the third Sunday of every month....a must see for a lazy Sunday afternoon! WINNER: The winner will be randomly chosen from comments received on DT member blogs. The winner will be announced on the CDS blog Thursday, September 20th. Enjoyed the hop. Did not see a Sun blog hop post for Jerusha so I commented on her Sat post. I really enjoyed all the inspiration from the blog hop. Great interpretations on the theme. I also didn't see a Sun. blog post for Jerusha so I commented on her digi release post from Sat. Thank you for the great hop! Wonderful hop ladies! Love all the inspiration! Sorry Lisa, for some reason I couldn't leave a comment on your blog. I did love how you did your tree and the dimensional glaze on the ornaments! What a fun hop, ladies! Love your images and the variety of cards was great. What a fun challenge. Thanks for the inspiration! Great Hop. I love seeing all DT Creations. I tried to leave a comment on Lisa Lara page but I will not let me comment on any of her post. Not sure whats going. Lisa your card is beautiful. I love how you used the ornament sentiment.